During a recent crosswalk sting here in the San Fernando Valley, police issued over a dozen tickets to pedestrians for violations that included starting to cross a street when a red hand was flashing. As one officer on the scene explained it, "The red hand works for two reasons: to basically safeguard the pedestrian and allow the traffic to start moving." "A driver facing a steady circular yellow or yellow arrow signal is, by that signal, warned that the related green movement is ending or that a red indication will be shown immediately thereafter." 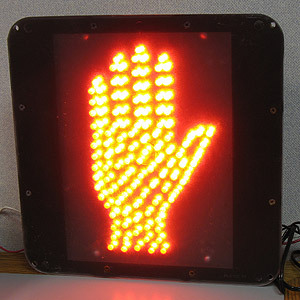 However, when the flashing "Don't Walk" or red hand signal is shown, "No pedestrian shall start to cross the roadway in the direction of the signal." Notice that while a yellow light is just a warning to drivers, and doesn't prohibit them from entering an intersection, a flashing red hand means a pedestrian can't even start to cross--even a really speedy one, who knows they can make it across the intersection in plenty of time. While some might argue that this is to protect pedestrians, I have to suspect (particularly given the statement of the police officer above) that the law is written this way to make sure those pesky pedestrians don't interfere too much with drivers who want to make right turns on red. If we really care about promoting alternative transportation modes at the same level of driving, we're going to have to examine laws like these that subtly bias the transportation system against pedestrians.